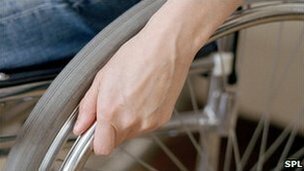 MPs have criticised the test being used to see whether people claiming disability benefits are fit to work. The Public Accounts Committee said the Workplace Capability Assessment had resulted in too many wrong decisions which were overturned on appeal. Its chair Margaret Hodge accused the Department for Work and Pensions (DWP) of being “unduly complacent” and of hurting the “most vulnerable”. But employment minister Mark Hoban accused the MPs of “scaremongering”. The Workplace Capability Assessment tests was introduced in 2008 to assess entitlement to Employment and Support Allowance, after it was claimed the old system was failing. The company Atos was paid £112.4m to carry out 738,000 assessments in 2011/12. The committee found 38% of appeals against the DWP’s decisions had been successful. Ms Hodge, a Labour MP, accused the government of “poor decision-making”, which was “damaging public confidence” in the system. Although Atos has faced criticism, “most of the problems lie firmly within the Department for Work and Pensions”, she said. “The department’s view that appeals against decisions are an inherent part of the process is unduly complacent,” she said. “The work capability assessment process hits the most vulnerable claimants hardest. Although the department had “started to improve”, she said, claimants “too often” found the assessment process so stressful that their health deteriorated. “A key problem is that the department has been unable to create a competitive market for medical assessment providers, leaving Atos in the position of being a near monopoly supplier,” she said. In 2010, the government commissioned Professor Malcolm Harrington to review fitness-to-work benefit assessments. He subsequently called for an overhaul of the system to make it more “fair and humane”. Mr Hoban said the committee’s report “completely” failed to recognise this.